As a portfolio manager, Tormont Group provides an excellent collection of growth companies with high levels of accessibility. New opportunities are quickly identified, and communication with management is made easy. There is no platform in Canada comparable to that which Tormont offers. Our experience working with the Tormont Group has been nothing short of exceptional. Their report coverage is distilled in an investor-friendly, comprehensive manner that allows for efficient opportunity assessment and follow-up. The introductions made between our Company and potential investors/institutions have resulted in solid lead generation. A membership only subscription platform and intelligence source for institutional investors which provides relevant and credible information on the top growth opportunities identified by Tormont Group in the North America. Member companies are the upcoming new leaders in their segment, focused on new technologies, innovation, and disruption. All present compelling reasons to own. A membership only subscription platform and intelligence source for institutional investors which provides relevant and credible information on the top growth opportunities identified by Tormont Group in the North American small cap segment. which could drive value appreciation and any other feature which would enable a multiple increase in market cap over the next 6-18 months. 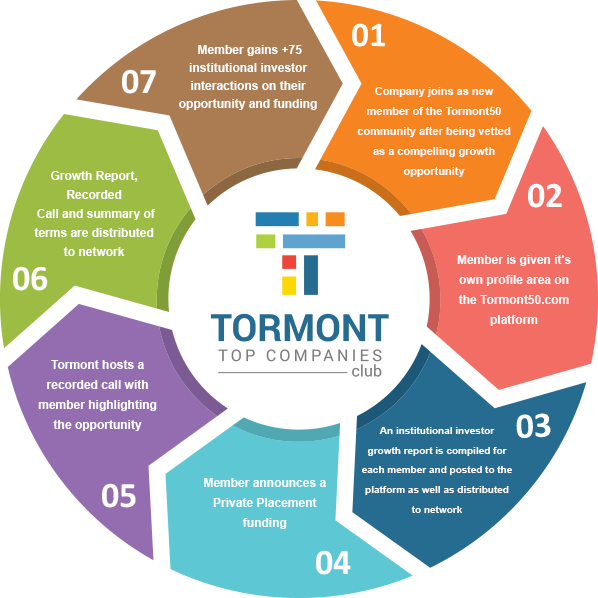 Tormont Group offers each subscriber a quarterly personal meeting whereby our team will briefly summarize new opportunities on the platform. A subscription platform and intelligence source for companies and institutional investors. Provides relevant and credible information on the top growth opportunities identified by Tormont Group in the North American small cap segment. Companies we profile in Tormont50 demonstrate compelling growth qualities. Including but not limited to, undervaluation relative to peers, new and innovative/disruptive technologies or methods, management/board evolution, upcoming events likely to drive value appreciation and other features which would enable a multiple increase in market cap over the next 6-18 months. Member companies are the upcoming new leaders in their segment, focused on new technologies, innovation, and disruption. All present compelling reasons to own. Membership is limited to a maximum of 50 Companies. Our group of experienced buy and sell side professionals compile a detailed report on each Top Company opportunity which is updated as relevant events and milestones occur. Subscribing institutional investors are each provided a unique user ID and password which will enable them access to the platform at www.thetopcompaniesclub.com. Subscribers have an opportunity to find out more on companies of interest by requesting additional information from the company, a conference call with the company as well as face to face meetings with the company. These options are provided for each company in their profile area. We host an annual Tormont50 conference in which all member companies and subscribed institutional investors will be invited. Tormont Group is a collective of Corporate Advisory, Marketing & Digital Media, and Public Relations experts. What is your favorite company right now?